We talk about lots of tiaras on this blog that can be converted into other pieces of jewelry. Generally, tiaras are transformable into necklaces or brooches. But today’s small tiara is one of the few sparklers that can be worn as either a tiara or a bracelet. The piece, which was made in 2008 by Boucheron, belongs to one of the most stunning queens in the world: Queen Rania of Jordan. Rania has more substantial tiaras in her collection (most notably, an unusual and gorgeous tiara that incorporates Arabic script into its design), but this smaller, convertible diadem has been brought out for some big occasions. In 2008, she made her first appearance in the piece at a banquet during a state visit to Brunei. Two years later, she chose it for the wedding of Crown Princess Victoria of Sweden in Stockholm. 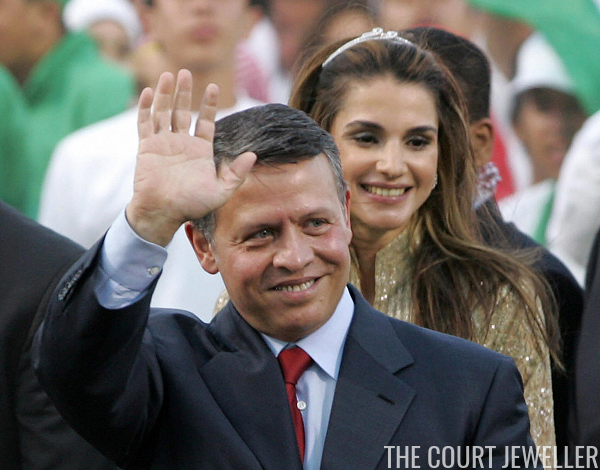 In 2009, Rania wore the tiara for an even more important event for Jordan: the tenth anniversary celebrations of her husband’s accession to the throne. The public got a chance to see the tiara when she and Abdullah rode in an open-topped car through the streets of Amman. But while she wore a different tiara at the coronation — the tiara made by Cartier for Queen Alia, which was borrowed then from Princess Haya — Rania wore the same Elie Saab gown in 2009 as she had ten years earlier. She also wore the tiara in 2016 for a state visit to Belgium. Simple and sleek, the bracelet tiara may be tiny, but in a way it complements Rania’s elegant, classic style better than more elaborate pieces would. Some have suggested that teeny tiaras like this don't pack a major style punch, and that may be true, but I'd certainly rather see a small tiara than no tiara at all! I do, however, wish that this piece were a bit longer on the sides, as it stops a bit short on Rania's head. Maybe a few extra diamonds would do the trick?